Delicious food is one of the best things about Christmas, in my opinion! But who wants to slave away in the kitchen all day on Christmas Eve or Christmas Day? Make up a double or triple batch of cookie dough and keep it in the freezer to give as gifts or to use when company drops by unexpectedly or you need a treat to take to a gathering at the last minute. 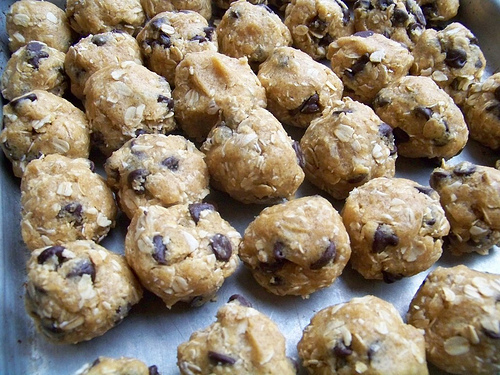 Here’s one of my favorite Chocolate Chip Cookie recipes. Make Homemade Baking Mix in order to quickly whip up a pan of Cinnamon Roll Biscuits for Christmas morning. You can use it in place of Bisquick in any recipe. This year, I made biscuit dough ahead of time and stuck it in the freezer to be able to quickly make Brown Sugar Biscuit Twists for a Christmas Brunch at my family’s house the day after Christmas. I put together the dry ingredients from the Glazed Cinnamon Scone recipe and froze them earlier this month. For Christmas Eve breakfast, we’re having scones, scrambled eggs, and juice. It will be a snap to put these together since I already have the dry ingredients measured out. 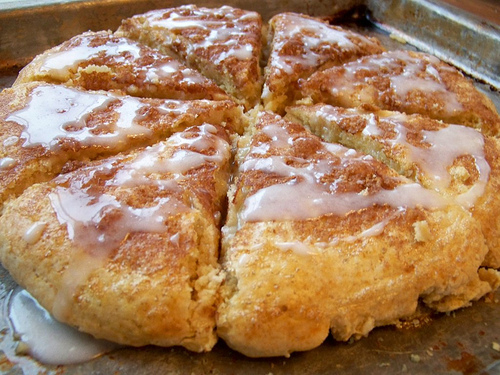 Fresh Cinnamon Rolls just can’t be beat, but they can be time-consuming to make! Reduce your workload by making the dough in the bread machine and then roll out, cut, and freeze them. Find detailed directions on how to freeze, thaw, and bake Cinnamon Rolls here. 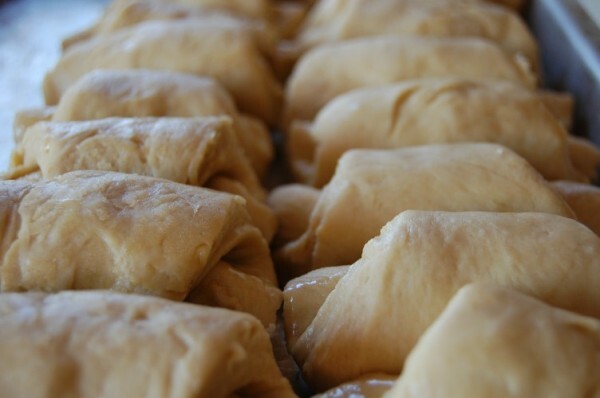 Looking for a delicious roll recipe that can be made ahead and frozen? 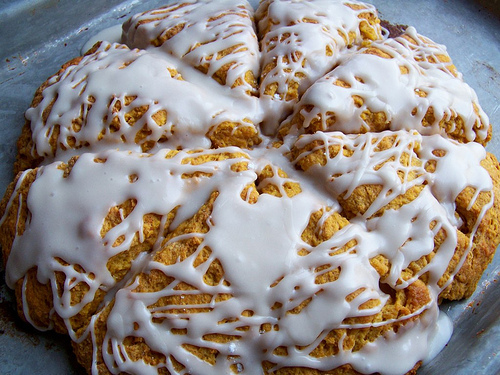 Check out our family’s Butterhorn recipe. It’s a little time-intensive, but oh so worth it! This Chocolate Chip Banana Bread freezes really well and is perfect to make ahead in little loaf pans and give as gifts or to serve for a Christmas brunch. 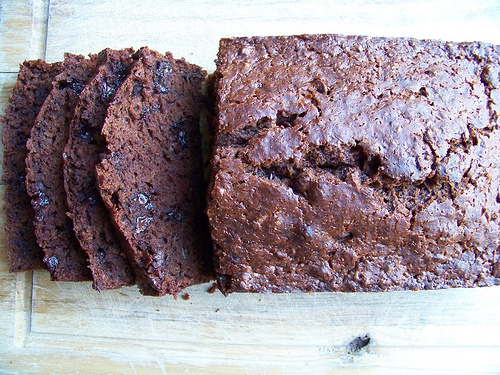 Not a banana bread fan? Try my Pumpkin Chocolate Chip Muffin recipe. 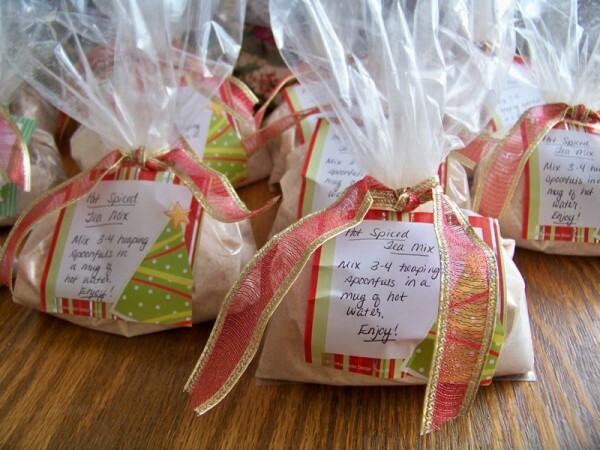 Homemade drink mixes are great to give as gifts or to have on hand to serve at Christmas get-togethers. Plus, you can keep them for months in the freezer! What are some of your favorite Christmas foods to make ahead and freeze? Share the recipe links in the comments! 21 Days to a More Organized Christmas: Mail Your Christmas Cards--or not! Looking for more? Read more posts about 21 Days to a More Organized Christmas. Love the pumpkin chocolate chip muffins. I make a huge batch of them and keep them in the freezer to grab for a quick breakfast. Today I put together some sour dough biscuit dough that can stay in the refrigerator for up to 2 weeks. It just gets more sour the older it is. We’ll be using this for our bread for our Christmas meal. All we will need to do is put them on a baking sheet, let them rise and bake. I made homemade gluten-free ravioli and froze them (raw) for Christmas Eve supper – yum! Is there a link for the gluten free ravioli? I haven’t had ravioli in years!! There is not. I just modified the pasta recipe in Carol Fenster’s 1000 G.F. recipe book by changing up the flour to rice flour, potato starch or tapioca starch, and flax seed. I mix it up in the food processor, use a hand pasta crank to roll it out, then fill it with something good (turkey/apple or cream cheese/sundried tomato for Christmas) and freeze them raw. The gluten free dough works great (G.F. Girl and the Chef also have a gluten-free pasta dough recipe) and I just hand form them and pretend I’m a little Italian mama 😉 My husband, a gluten-eater, loves them. To bake, take frozen, raw ravioli, put them in a baking dish, cover with your favorite pasta sauce, sprinkle cheese on top, and cover with foil. Bake at 350 degrees for between 30 and 45 minutes, and they cook up perfectly. Boiling them ruins them. Hope this helps! It takes a try or two to get it, but once you do, each batch of pasta makes a huge amound and you can whip them out of the freezer for a quick week night dinner. Yesterday, I made Stephanie O’Dea’s crockpot meatballs and stuck them in the freezer. I plan on putting them in the crock for a simple Christmas dinner. 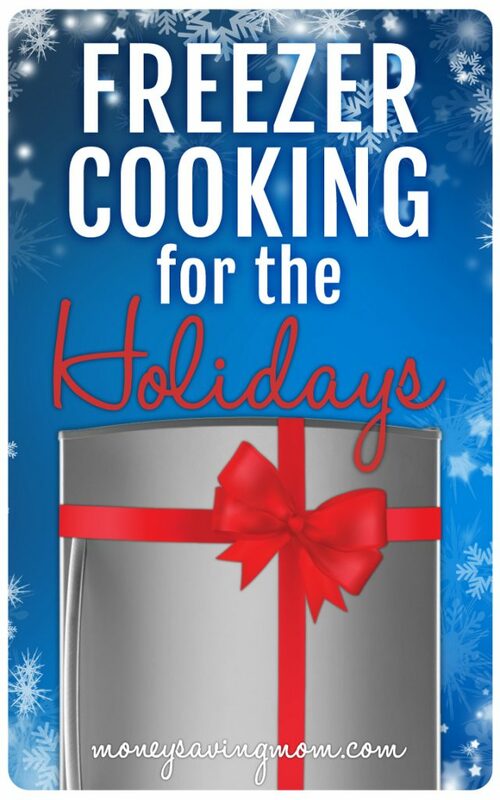 We’ll be having a more elaborate dinner with family the next day, so I was happy to find this recipe to make so I don’t need to fuss on Christmas day! These look sooo yummy. I’m also going to throw together some breakfast egg casserole and pour them into muffin tins so they bake quickly for breakfast on Christmas morning. The egg casserole in muffin tins is brilliant! Thanks for the tip. I have pull apart cinnamon bread in my freezer for Christmas Morning. Also tons of cookies (already baked) to whip out for dessert trays. And the sauce for Christmas Eve lasagna is from my November freezer cooking session. Yay for planning ahead! True confession: I caved about bought frozen hash browns for the breakfast casserole. Significant because I’m anti-convenience food. And I have 10 lbs potatoes from our CSA in the basement. But there was no way I was going to get them prepped. Buying frozen was sanity saver. I got a 10-lb bag of potatoes at Thanksgiving on sale for $.99. I knew they wouldn’t last until Christmas/Hanukkah. Right after Thanksgiving, I peeled and shredded the potatoes (w/ food processor) and froze them with my FoodSaver. Now I have shredded potatoes for latkes. Yay. The messy part is done. Good for you! I need to put this in my notes for next year. In general I should add pototo prep to my freezer cooking. We haven’t had hashrowns in years (since I stopped buying frozen) because I never think to prepare the potatoes ahead of time. I am having a brunch on C Day and would like to know how to heat a BUNCH of waffles/pancakes, rather than a couple at a time in the micro, if I make ahead to freeze? Also bacon same thing? Wont they dry out in the oven? I don’t have any advice about reheating pancakes or waffles because we don’t like them reheated but it is so easy to just cook your bacon in the oven the day that you need it. Fill up a large rimmed baking sheet with a single layer of bacon and bake at 400 degrees for 15-20 minutes depending on the thickness of the bacon. A breakfast casserole is the way to go for a crowd as you can assemble the day before and bake that morning. I have NEVER even thought to cook bacon in the oven, I have always pan fried them. Don’t they splatter grease all over the oven? I am curious to try this out! I use a pastry brush and brush my waffles and pancakes with butter right as they are finished cooking. This gets the butter flavor but means i dont need to mess with butter when i am reheating and running out the door it also seems to help them not be as dry when I reheat. We do bacon on a sheet pan in the oven to cook it and I have cooked it, cooled it and reheated it the same way. We do our waffles/pancakes directly on the oven rack instead of a pan so they don’t get hard on top and soggy on the bottom. For defrosting loads of pancakes, I just did this the other day. Put all the frozen pancakes in a Pyrex lasagna pan, cover with foil, bake until heated through. I was surprised to find that it actually worked out really well. The oven was on anyway for something else so it didn’t take any more energy. I use the toaster – quick and easy. Better texture than the microwave. I do have a 4 slot toaster, which helps. You don’t have to thaw the unbaked frozen scones or muffins. You can put them into the oven frozen, they will just take about 3-5 more minutes to cook. I do it this way all the time and it works great, such a time saver! Thanks for the tip! I just put a batch of scones in the freezer. 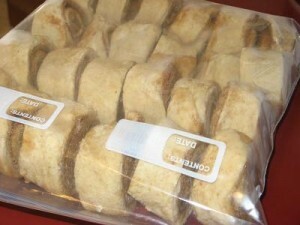 I actually gave my boss 4 rolls of frozen cookie dough today! There are so many treats around I didn’t want any to go to waste, this way she can slice and bake as many as she wants whenever she wants over the next few months. Honestly, with family visiting, I put together freezer meals (meatloaf, meatballs, enchiladas) a couple of weeks before their arrival. So far family has only been here a couple of days and it has been fantastic for the host (me) because my stress level is low. I can concentrate on other important things and not have to spend huge amounts of time in the kitchen. We like making pumpkin logs ahead of time and freezing them for gift giving. Could you share your recipe for gluten-free ravioli’s? Thanks for the tip on flash freezing scones. I made up a double batch of Orange-Cranberry Scones tonight (one for tomorrow’s breakfast and one for later)…glad to know I can freeze them successfully! 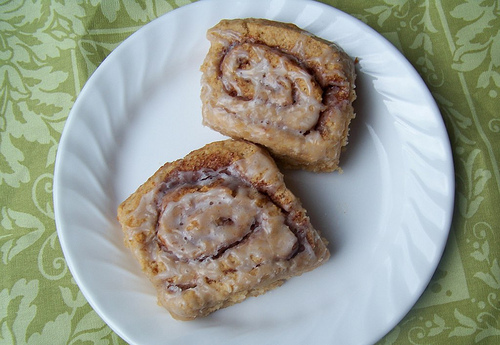 Oh, and I made your Bread Machine Cinnamon Rolls earlier in the week and froze them for Christmas morning….we love them! Thanks for the tips on freezing scones. I need to do that. I was just charting out what was going to be made on which day, so it’s great that you posted this with all these great ideas! I love this series. These are great ideas! I’ll be making my Dad’s famous sausage and egg casserole the night before Christmas (to cook in the morning)–a family tradition! For the last couple of years we have lasagna for Christmas dinner. A couple of weeks before we have lasagna and make an extra which we freeze for Christmas. I also freeze pumpkin bread, fudge, and different cookies giving us plenty of goodies for the holiday. One year, we decided that we’d make some hot chocolate mix for all of our friends for the Yuletide season. That turned out great, because we made enough of it to last for (what felt like) the whole year. Even though it’s not freezing, we also canned pickles one years – and everyone around ended up with a jar of Leo pickles (I went through a phase where they were all astrological signs). Thanks for the ideas! Wanted to put a plug out there that I’m really looking forward to hearing about your 2012 goal setting process and actual goals. Christmas stuff is pretty much taken care of and my mind is racing ahead to setting up for a successful new year. Excited to hear what you are planning! I baked nut roll a couple of weeks ago and froze it. Baked cookies last Sunday and put them in tins to stay fresh. As I posted above, I shredded potatoes and froze them right after Thanksgiving. I also froze mashed sweet potatoes that were on sale at Thanksgiving. My adult kids started to arrive last night. Yesterday, I roasted a turkey (free at BJ’s before TGiving), baked a ham ($1/lb at Target before TGiving), cooked lots of greens (collard, spinach, broccoli rabe – they hold up well to reheating), baked rolls and sweet potato biscuits. The ham, turkey and greens take up much less room cooked than raw. I also have cheese, salami, pate’, hummus, bagged salad and tons of fruit. I will make a big breakfast on Christmas Eve morning – bacon, latkes (we are a multi-ethnic household) & eggs. But otherwise, I don’t need to cook until Christmas dinner. Thank you Crystal, I made your recipe for Pumpkin Chocolate Chip Muffins this morning-and I only had about 1/2 cup of chocolate chips in the house-so I put those in, and then I found some Milk Chocolate Toffee Bits-so I added about 2/3 of those-wow they were so good!! Make do sometimes with what you have-I did and they were wonderful. 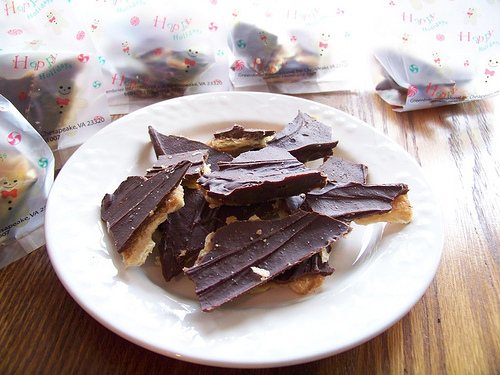 Made the Christmas candy after seeing your recipe–my DH words, “not only good, but sinful!” Definitely a keeper. 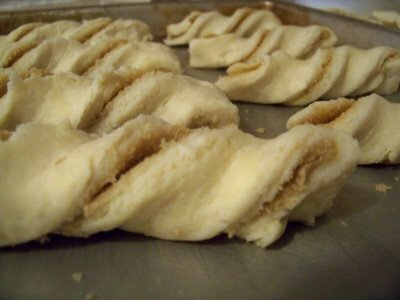 Also made the Brown Sugar Twists for Christmas morning–wonderful. Only change I will make to them for next time–almond flavoring. Thank you for the recipes. More to try in the weeks to come. My great grandmother’s apple streudel! Much easier to manage than when I had 10 in my home this weekend.